Thanksgiving has passed, which means the holidays have officially begun! 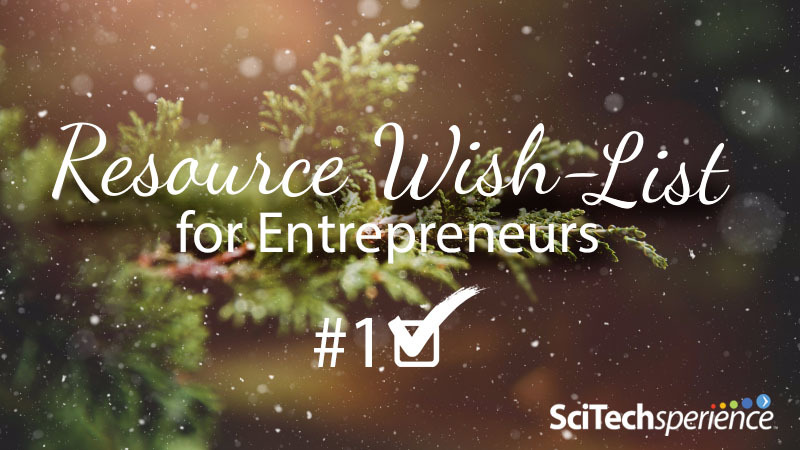 In the spirit of the giving season, and as a means of expressing our gratitude for your continued engagement and support, we at SciTechsperience are proud to offer an essential resource guide that we’re calling the Resource Wish-List for Entrepreneurs. Today’s feature is the first in a four-part blog series. In a previous post, we recapped an event that SciTechsperience co-hosted, connecting science and technology companies with Minnesota’s economic and entrepreneurial resources. One of our co-hosts was the University of Minnesota’s Office of University Economic Development (UED). They also happen to be the first organization we’ve chosen to highlight on our list of must-have assets for small business and start-up success. Assistant Director Tim Tripp represented the UED when he gave his presentation that morning. From small startups to large pharmaceutical companies, he explained, the UED office has served as the front door for economic development, connecting business and industry partners with the U of M’s resources for the last four years. The office works simultaneously with government and economic development partners to identify opportunities for collaboration to grow and diversify the Minnesota economy. When the UED began, they knew they needed to provide an additional service that would not only allow them to stand out but would work to solve persistent issues faced by the business and entrepreneurial market. The problem: The system wasn’t set up to provide graduate students with opportunities to get skills in business. The Solution: The Economic Development Fellows Consulting Program. The Fellows Consulting program was created to help support business needs, train a “from graduate school to industry” workforce with relevant and applicable skills; all while providing opportunities to students. Five project proposals are accepted per semester wherein each selected company is assigned a team of five graduate students led by an Economic Development Fellow. Just over one third of the students working in this program are PhDs. All at no cost to the small business. The UED typically scouts out potential companies they’d like to work with but they also accept and encourage project proposals. So, no need to wait for the phone to ring! The Economic Development Fellows work with companies from all industries. The team sticks with the project from the initial goal identification stage to addressing unique business challenges, helping their clients prepare for the future. New project cycles occur three times a year, starting in January, May, and September, and typically last 12 weeks. Whether creating your entrepreneurial wish-list, or simply prepping for 2018’s quarterly goals, make sure to check out the UED and their project proposal. There’s nothing to lose and so much to gain. For more information, contact frontdoor@umn.edu.